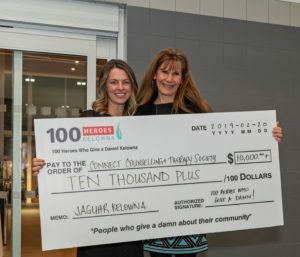 A huge congratulations to Connect Counselling & Therapy Executive Director, Roxie Van Aller, for her impactful speech at 100 heroes’ quarterly meeting last night. Roxie was awarded a $10,000.00+ donation from the group. 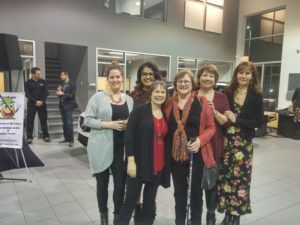 Thanks to Brett Wilson, known for his role on Dragon’s Den, and Jaguar/Landrover dealership for contributing an additional $10,000.00+ to support the other charities at the event. What a night! 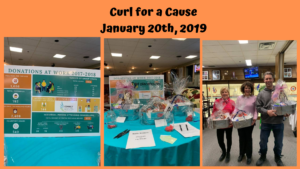 Thank you to everyone who attended “Curl for a Cause” on Sunday, January 20th! We raised $450 for our Children’s Lowering Anxiety group! A special thanks to The Kelowna Curling Club for their ongoing support! Thank you to everyone that came out to support Connect Counselling & Therapy at Curl for a Cause! We raised approximately $600 for our Men in Change group! 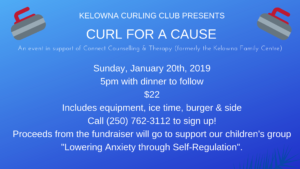 Our next Curl for a Cause will be January 20th, 2019 in support of children who suffer from anxiety! It’s a great opportunity to come out and curl for only $22.00. This includes equipment rental and burger/drink. $5.00 for from each burger/drink goes to supporting our Men in Change drop-in group. This group provides men with a safe place to make changes as they challenge societal norms of what is means to be male, and develop skills to deal with difficult emotions. Themes include: Unfairness, Boundary Work, Respectful Communication, Family Conflict, Solution-focused Work, Managing Anger, Emotional Intelligence, Shame and Resiliency and Building Sense of Self. This group is a weekly drop-in group is co-lead by a male and female professional counsellors at Connect Counselling. Call The Kelowna Curling Club at (250) 762-3112 to sign up! Come out and have fun! Effective September 24th, The Kelowna Family Centre will be doing business as “Connect Counselling & Therapy Society”. We will continue to offer the same great services with our talented group of professional counsellors. Contact email: connectcounselling@shaw.ca; phone and fax will remain the same. 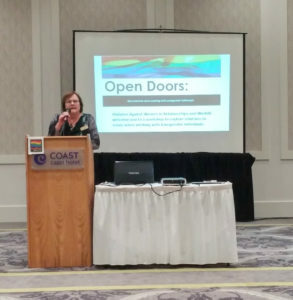 Lisa Binnie, Executive Director of the Kelowna Family Centre & Chairperson of the Violence Against Women in Relationships committee (VAWIR), speaking at Open Doors, a transgender workshop exploring solutions to the issues and challenges faced when working with transgender individuals (sponsored by WorkBC & Kelowna VAWIR). Guest speakers were Dr. Trevor Corneil, VP Population Health and Chief Medical Health Officer of Interior Health, and Davina Kula, Director of Education, Okanagan Pride Society. The workshop was attended by several team members of the Kelowna Family Centre. The Kelowna Family Centre was an exhibitor at the Immigrant Services Fair in Kelowna on Saturday, March 25th. 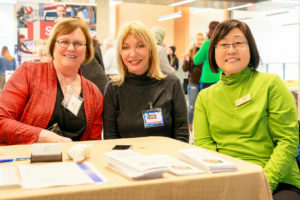 In January, the Kelowna Family Centre was chosen to be one of three presenting organizations at the 100+ Women Who Care Kelowna quarterly meeting. Lois Hansen, Clinical Counsellor at our Centre, gave a fabulous presentation of the value of our organization to the community. We are pleased to announce that the Kelowna Family Centre received the most votes and were presented with $6,300.00. We are extremely grateful for this donation. 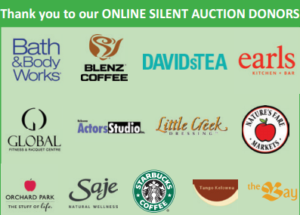 The Online Silent Auction has ended. Thank you for your generosity and best wishes for a wonderful holiday season from the Kelowna Family Centre family.